I am going to post what I finished so far, will update the post as the build goes along. There has already been a considerable amount of changes from the original plan and it also got a bit more expensive than expected but hopefully it will end up being a good light unit and with some more blues maybe even reef ready for the future. 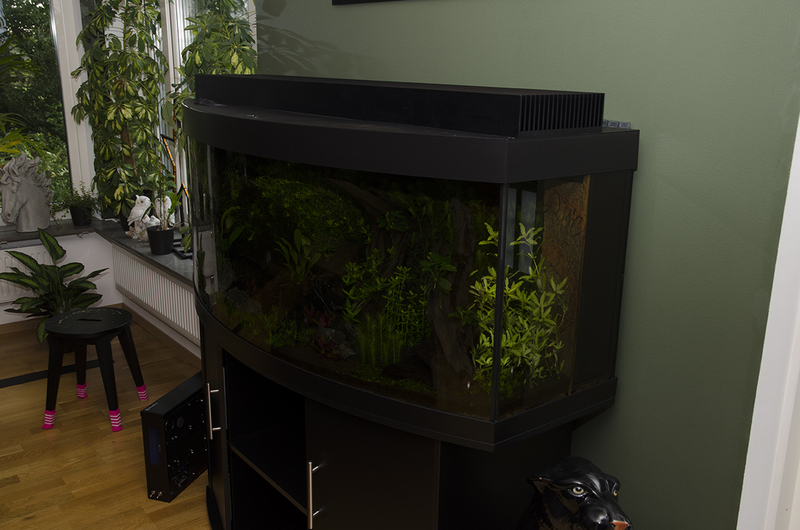 And I was feeling that the unit that came with the Juwel tank (T5 4 x 54W) was a bit on the weak side for my taste. 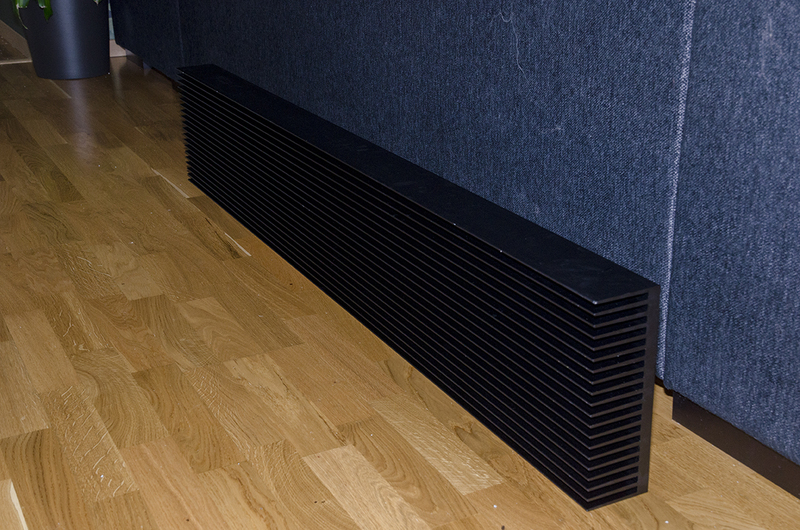 Plus the unit uses a custom length for the tubes which limits the choice of tubes somewhat. 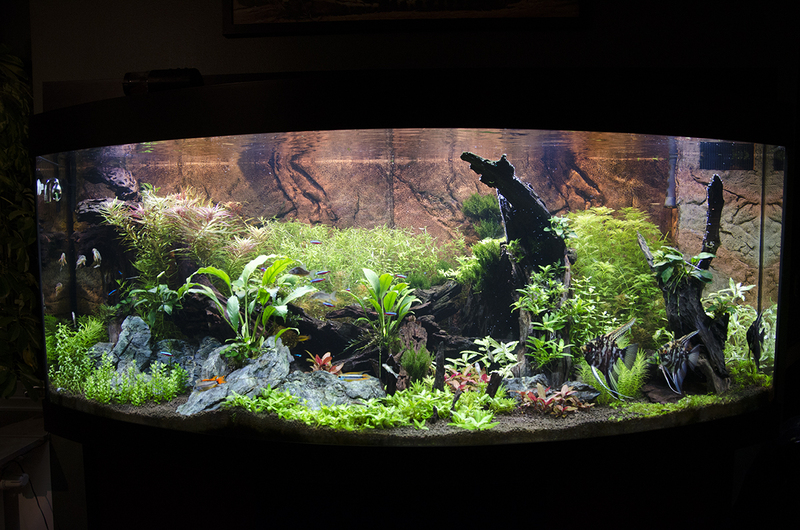 I think most would argue that the current light should be enough for the tank and I am aware of this. 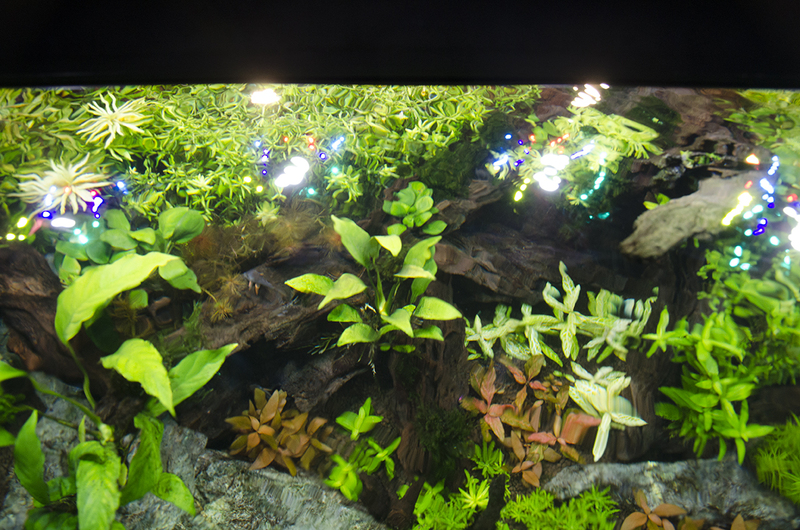 Still I feel that it is a bit lacking on the substrate and growing carpet plants is somewhat of a pain, especially after I added a lot of driftwood to the tank that don’t reflect much light and darkens the water somewhat. Originally I just planned to add some more T5 tubes but the stock light units takes a lot of space and I could not fit any more in there in a good way, also thought about MH but I don’t want anything above the tank spreading light into the living room and I would prefer a closed tank. Got three jumpy cats and a noise sensitive girlfriend (and I got noise allergy myself). 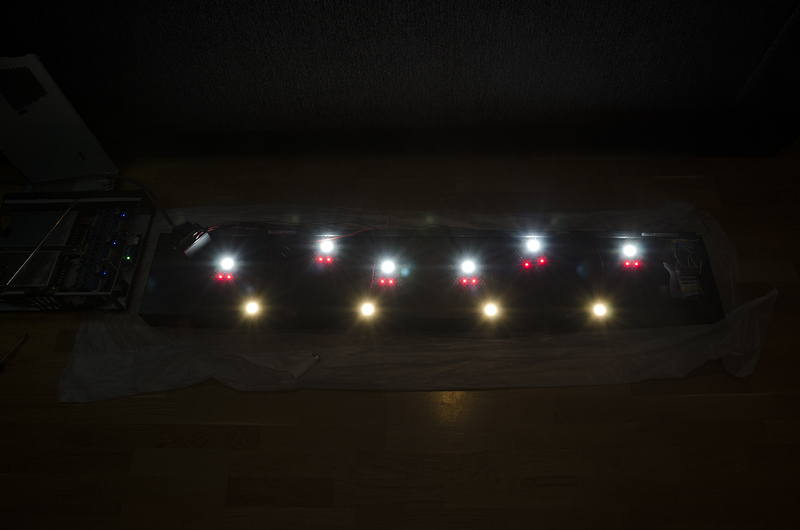 So I turned my attention to LEDs and got hooked the more I read about it. Somewhat of a pain to get into but it is starting to sink in now but for from an expert of course. The color control and dimming with a controller was also something that really appealed to my inner tech-nerd. I don’t know how many papers I have written on or how many times I have changed my mind but it is a lot! I think I have gone through each and every premade fixture there is. From the most expensive to the half DIY setups. They were either too expensive, for reefs, weak or too ugly so I decided/realized I will have to do it myself. I was originally going to go with a makersled heat sink even though it was silver colored. But I could not get an exact length cut and the shipping would have been monstrous. 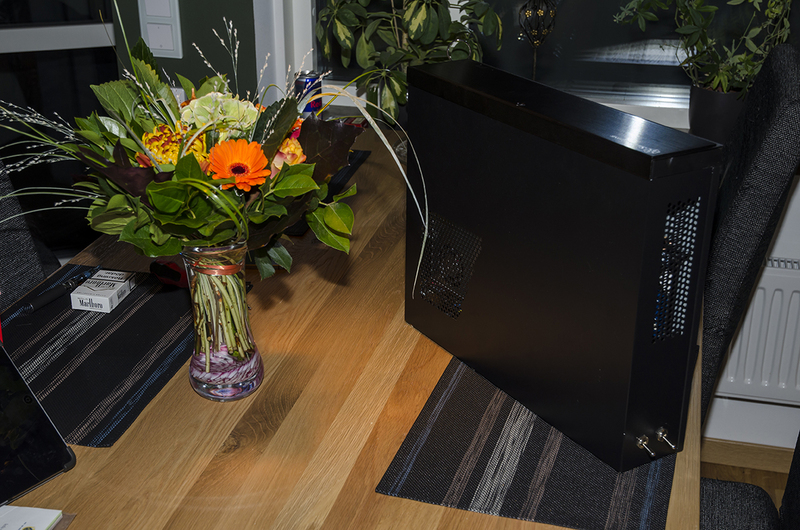 Did some research and was hoping to find someone here in Sweden to help me get a heatsink made. 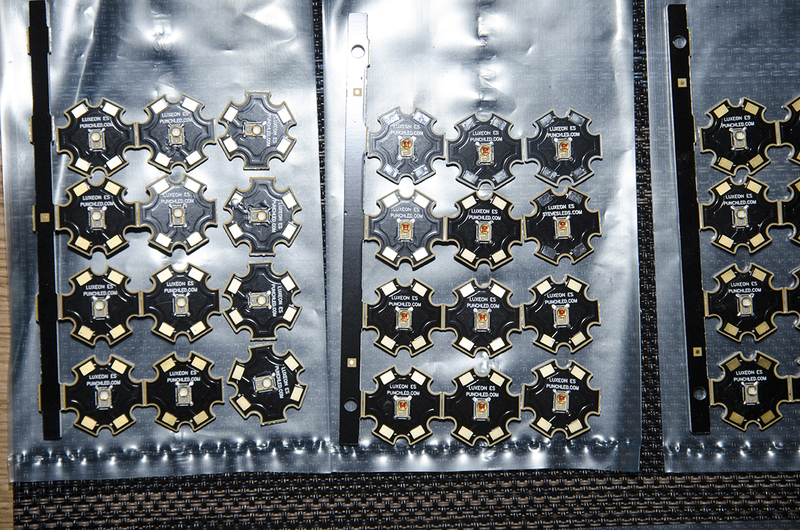 But the manufacturers were not very helpful and only willing so sell to registered companies. Did some reading on a bunch of forums and read somewhere (don't remember where) that some guy recommended Birmingham Aluminum in the UK, he had himself got a smaller heatsink made at a reasonable price. So threw a mail their way and after a couple of days got an answer telling me they do sell to private persons. He got the specs on all the leds and the total amount of LEDs i was gonna use and calculated that kind of sink I was going to need to run the thing passively. Ended up being their 1850HS model, specs here. 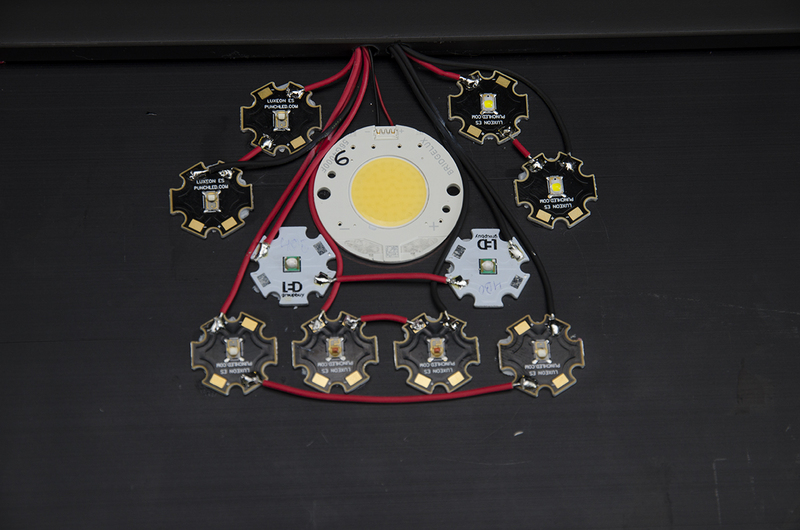 Was still unsure what LEDs to use but then by chance when doing some googling on LED drivers I stumbled upon a thread at reefcentral and here at plantedtank.net where O2Surplus was building a LED unit and was using Bridgelux Vero leds and I was hooked in a second. Not only that but he had also built his own LED driver boards which I found totally awesome. After reading through O2Surplus thread and creating a thread or two here on the plantedtank I finally decided, big thanks to O2surplus, gus6464 and jeffkrol for some really valuable input and ideas. Without them I most likely would have skipped the project all together. 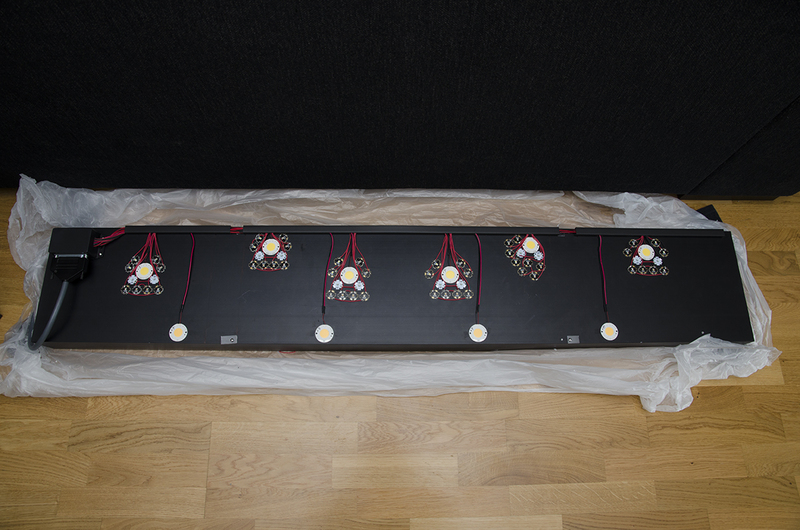 So this will yield 526 Watts of LED light which I think most would consider insane. 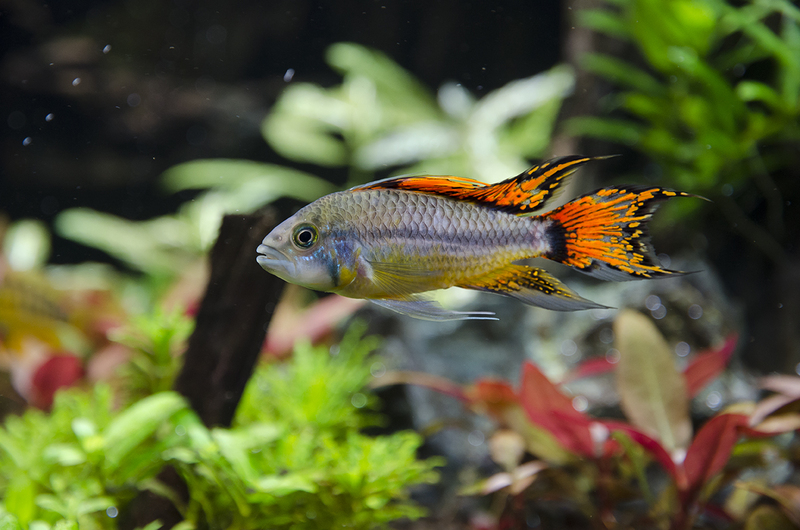 Putting this down in the tank would result in a disaster so I am aware of that, no worries! I have over-sized it just for the simple reason that I do not want to run the stuff near its max hoping this will result in it running a lot cooler, reducing noise and enhancing lifetime. 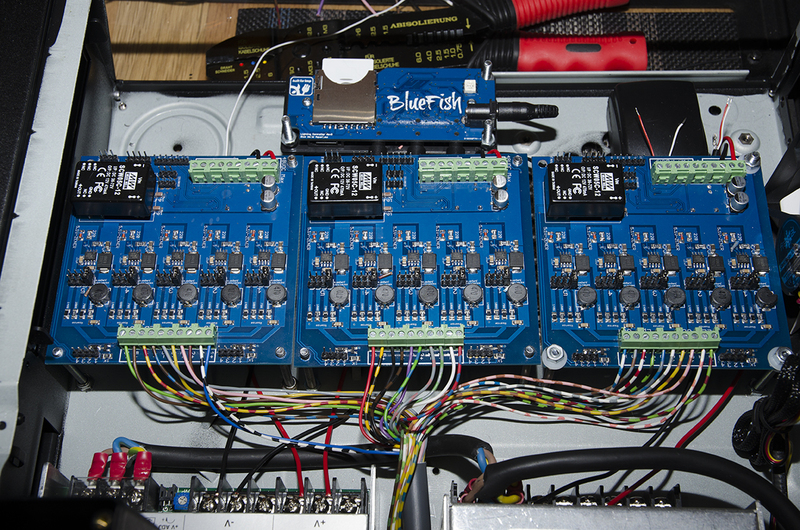 For those not familiar with the Bluefish controller, it has 6 PWM channels, WIFI, weather simulation and dimming support. 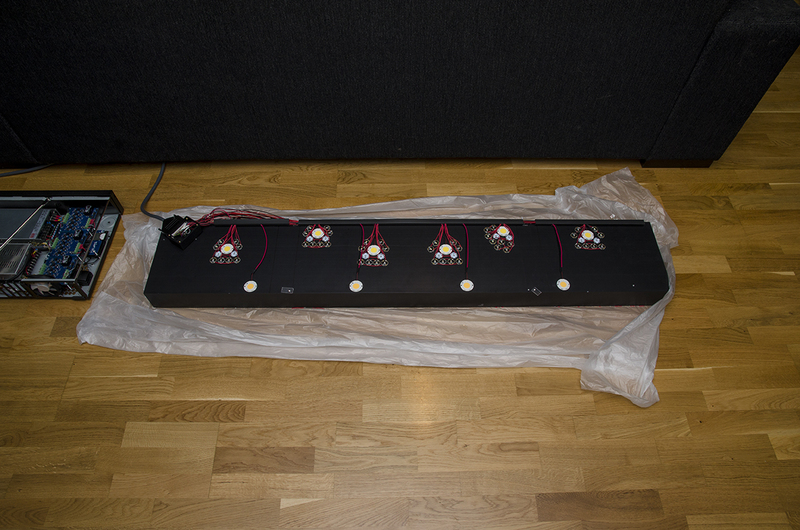 The Veros will go on one channel and then one channel each for the different color-leds (the violet ones will be on the same channel) for a total of six channels. 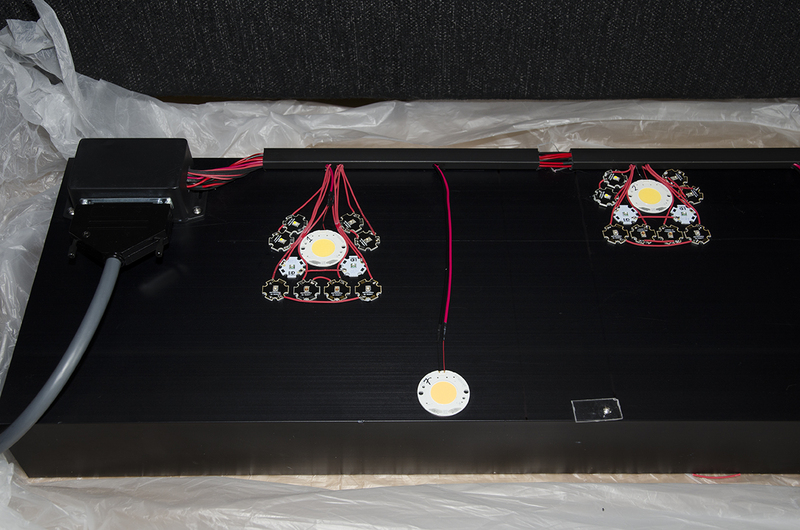 The 500 watt psu will supply the Veros with power and the 350 watt PSU will supply the color leds. 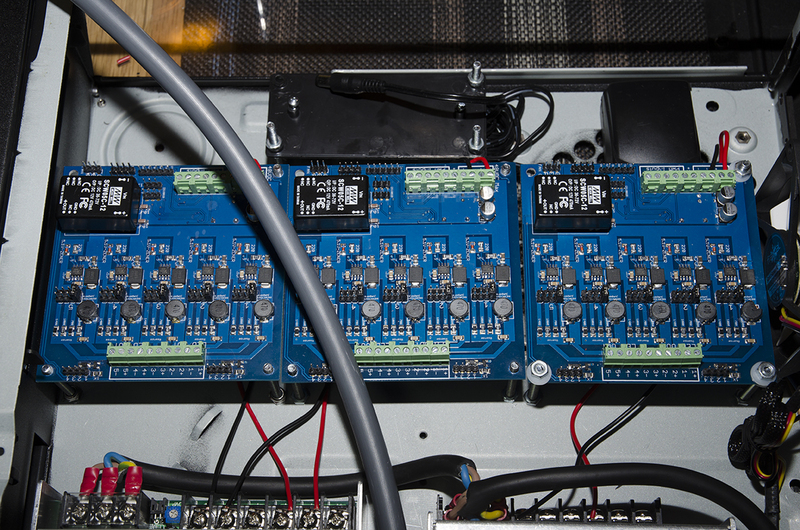 3 of O2surplus boards will be driving the whole show (15 drivers total), each Vero will be needing a separate driver. 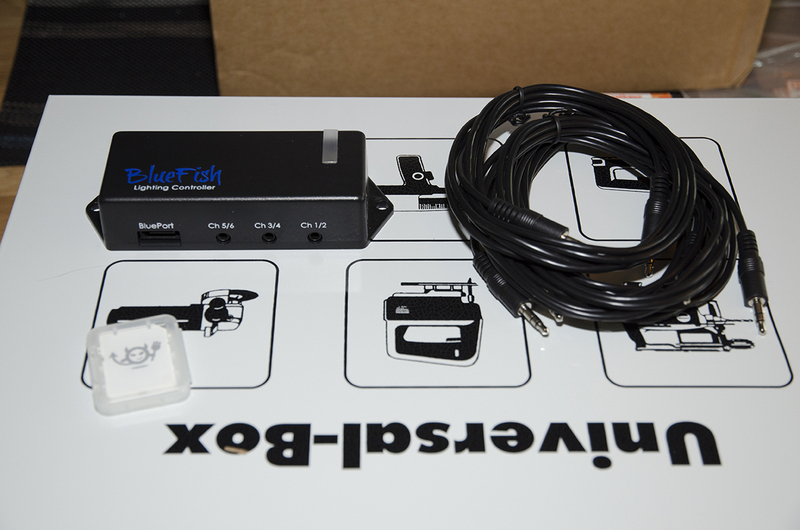 The Bluefish LED Controller did not expect it to be so small for some reason. 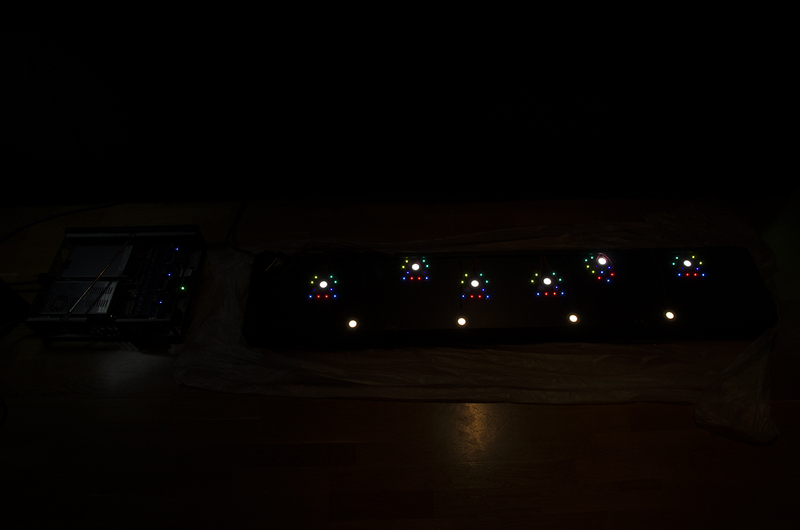 All the LEDS, white round ones are the Vero 18s and then the colored ones are on the stars. 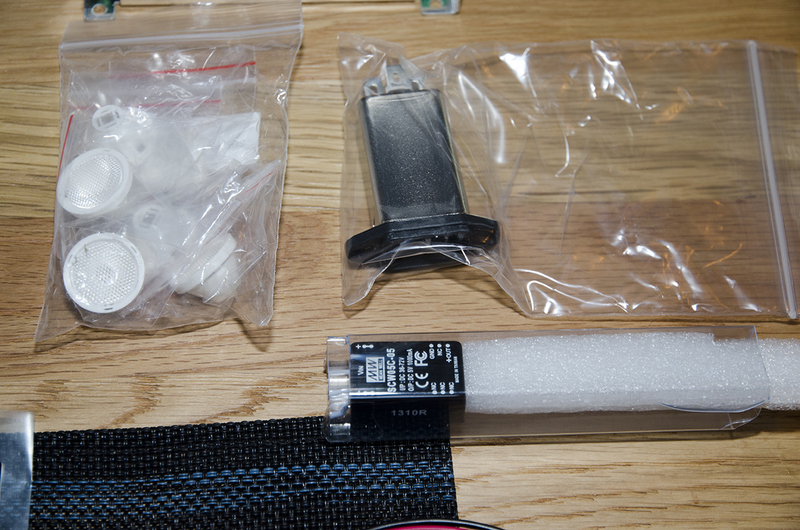 The connector on the upper right will be attached to the box for the mains in. Black box underneath it is a 48 to 5Volt transformer for the fan. Underneath that is the EZ cables for the Veros no need to solder on the Veros themselves, the cables will be soldered though. 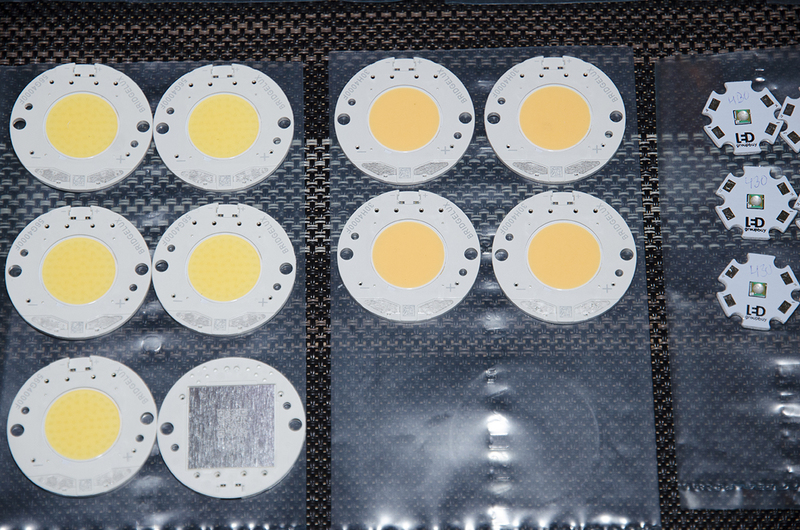 The Veros again, to the left 5600K ones and to the right the four 3000K ones. 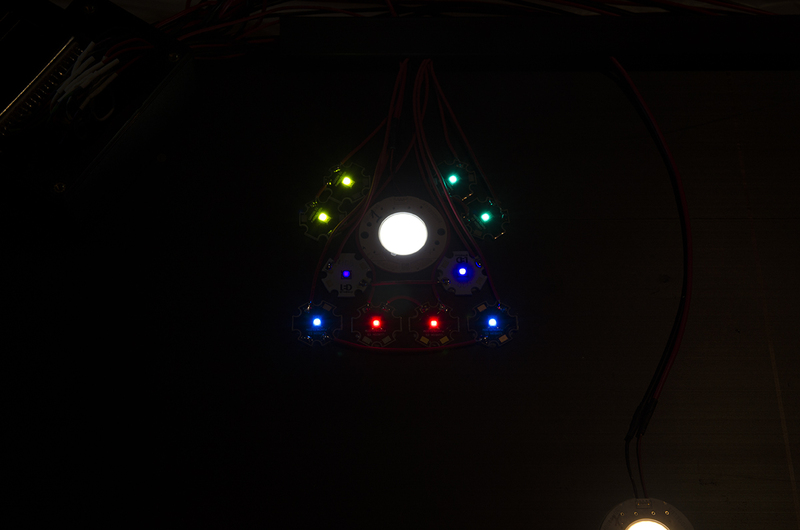 Some mixed colored leds, sorted. Closer look on the mystery box and connector. Also some of the lenses I ordered to the left (not sure if I will use any though). 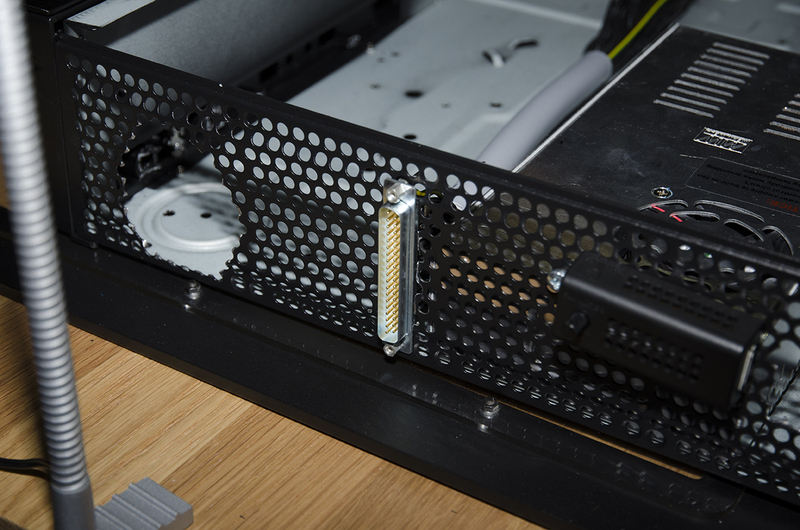 Here is the HTPC box (Silverstone Milo ml04b) that will be used to house the PSUs, Controller and Driver boards. Just to keep it neat and tidy. 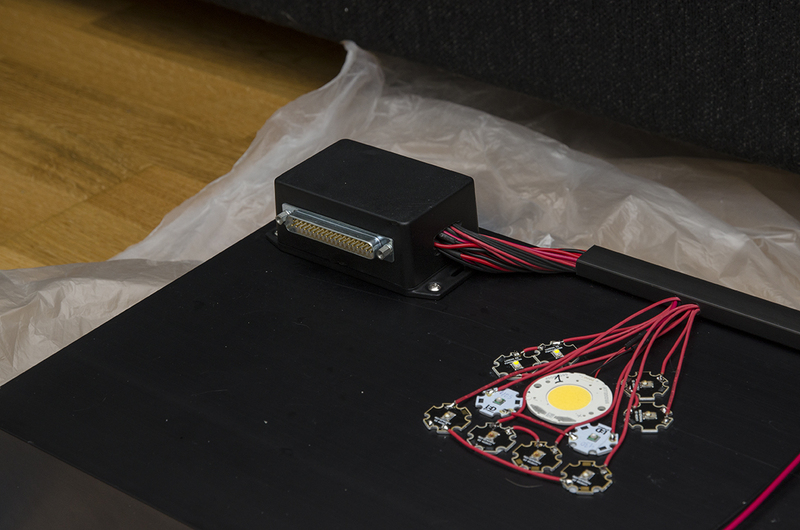 I will be using a D-Sub connector so the LED unit can easily be detached if it or the electronics box needs some work done to it. 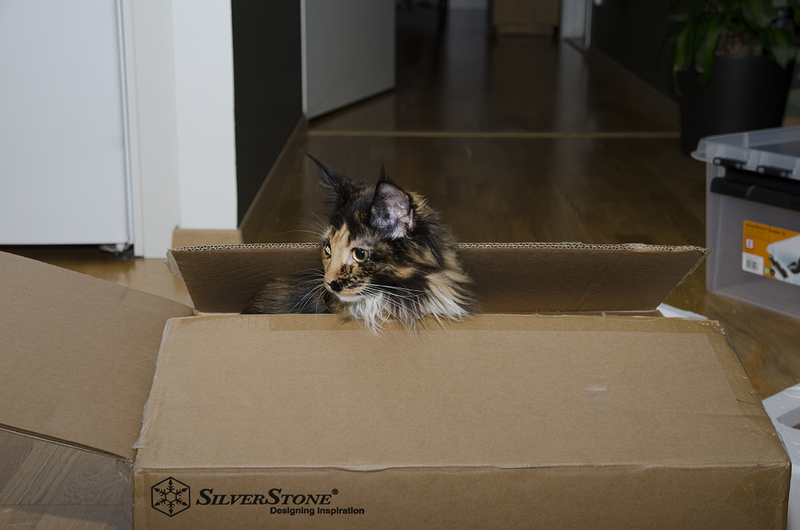 Stripped all of stuff inside the box and turned it into an empty shell. The box will be standing vertical inside the cabinet with the underside towards the stands sidewall and the meshed part towards the wall. 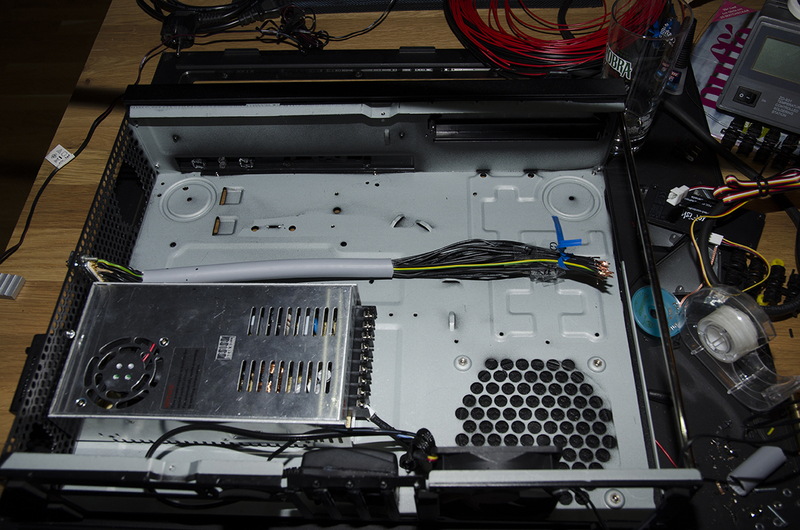 Mounted the PSUs inside the box, nice fit. 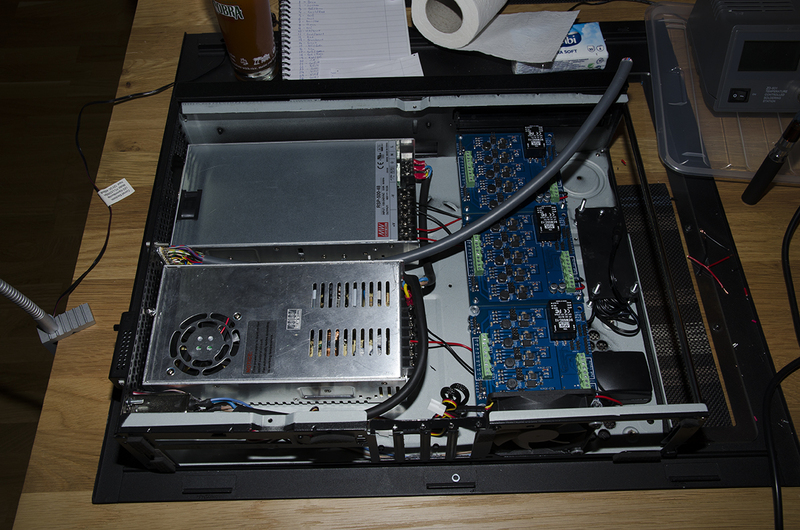 Just wish the 350 watt PSU had its fan in the backside of its case as well… oh well can’t have everything. Also mounted the mains socket and a fan controller on the meshed part. 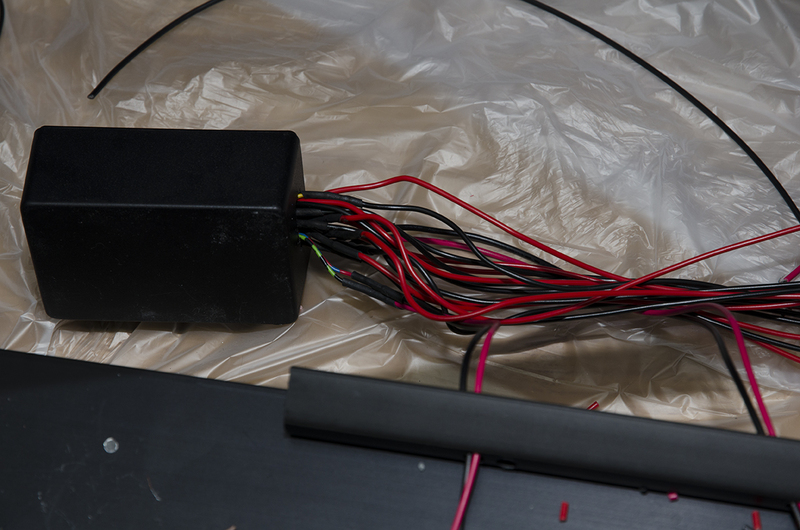 The cable I was going use from the case up to the LED unit. 34 wires in there, this was a 0,75mm2 version which I got because I misread current capabilities (looked at AWG size first and converted). But we don’t use AWG here in the Europe so I made it more complicated then needed converting it. 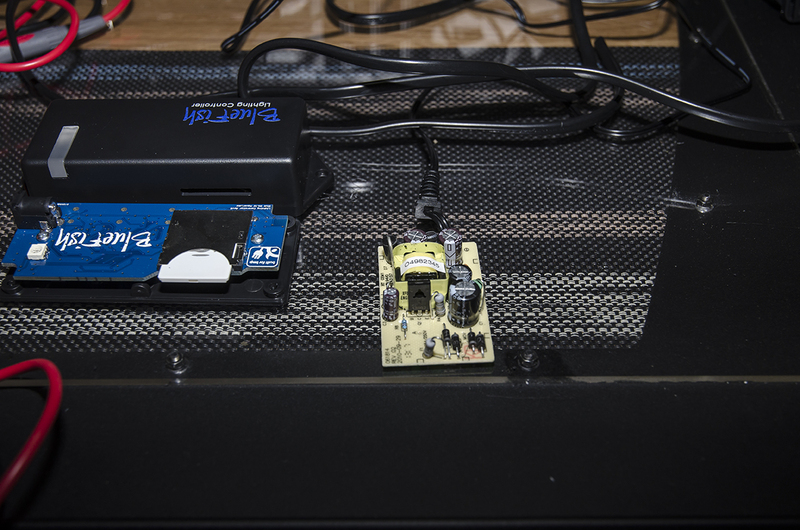 Disassembled the Bluefish controller so could mount it a bit up in the chassis using the holes in the PCB board. 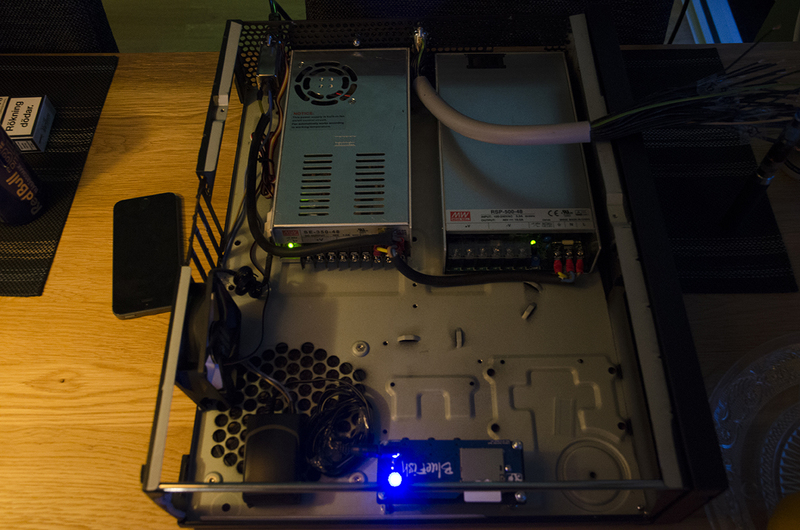 This way I could easily remove the WIFI card and get it closer to the small meshed part in the front of the chassis so the signal will be good and strong. Warranty VOID! 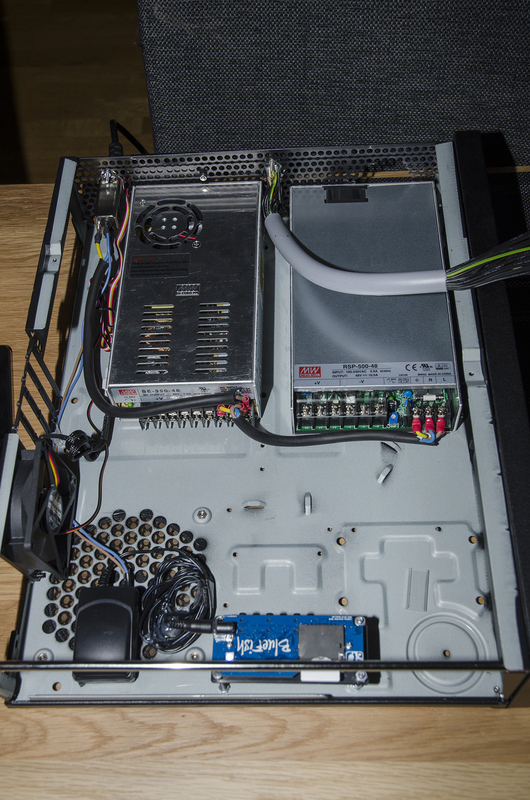 Also modded the 12V power supply for the controller so I could attach it directly to the mains socket in the chassis. Open it and soldered on an ordinary lamp cable and glued the case back together again. 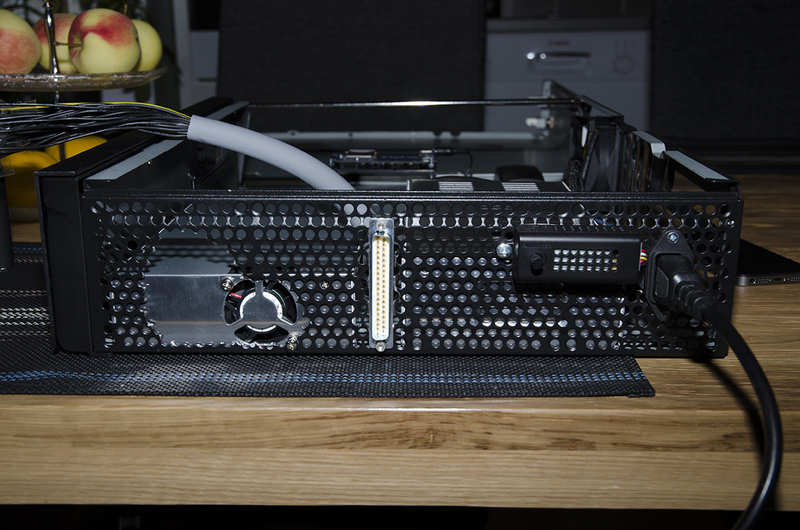 The male D-SUB connector attached to the case, running all the cables to the driver boards. Was pretty boring soldering there to be honest. 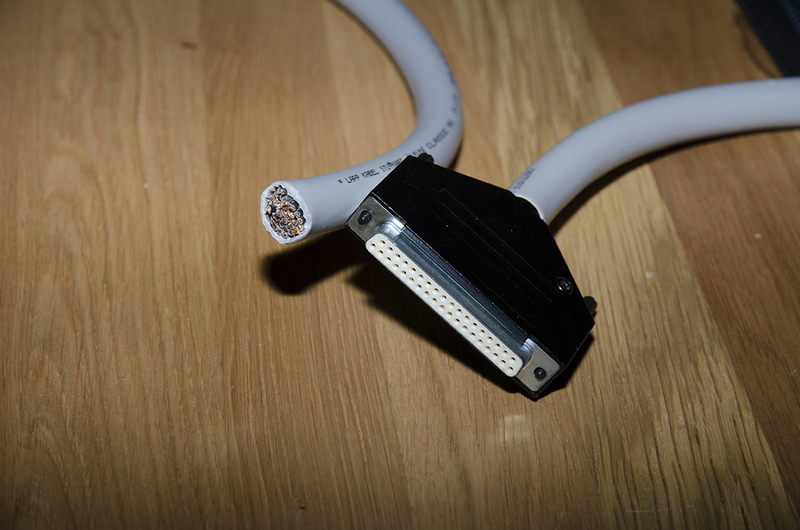 Another pic of the D-Sub connector. 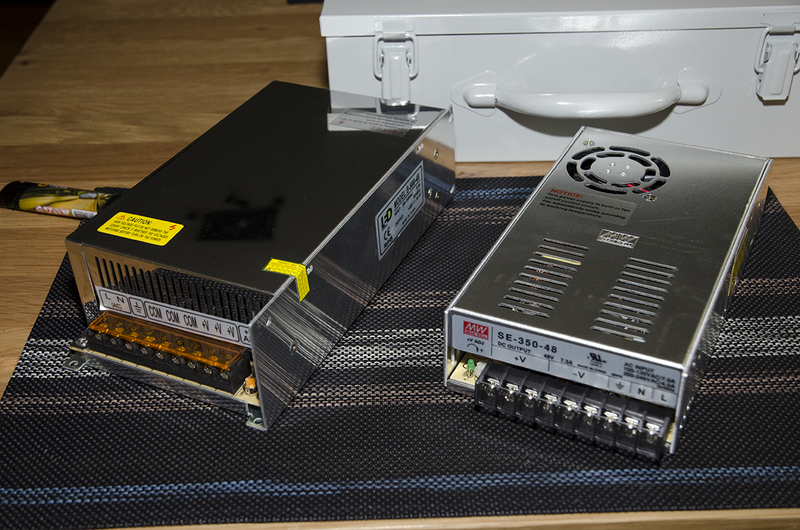 You might have noticed that the 500Watt LGB power supply is missing. 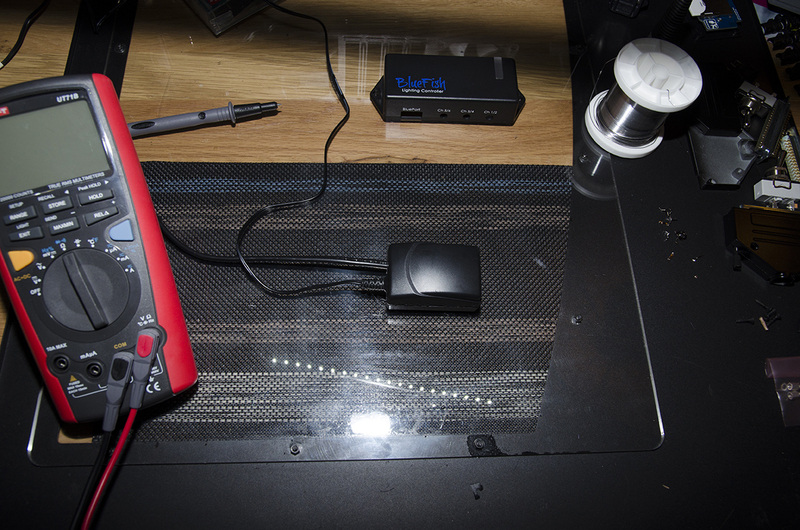 This is because when I tested it after mounting I made some fireworks and blew up pretty much. Opened it up and was welcomed by some of the worst soldering I have ever seen. Spilled solder on the component side of the board shorted 3 resistors and on the solder side on capacitor was not soldered and 3 lanes were shorted due to excessive solder use. So a heads up on that supply! Should probably contact LGB about this, but honestly it is a pain sending it back half across the globe to get a replacement. And considering how it was soldered I don’t want such a device in my build anyway. New 500Watt PSU from MeanWell mounted, checked the soldering on this one and it did not look like an amateur soldered it, good to go! Case assembled and standing as it will be doing inside the cabinet, pretty happy with the look. Maybe not the amount of “pro” I had hoped for but it will have to do. So now I am waiting for O2Surplus to finish the work on his Driver boards so he can send them on their way here. Have not happened very much unfortunately, no idea where my heatsink is, was hoping to give you an update after LEDs were mounted. Anyways received the smaller conductor wire and desoldered the old one and finished up the new one. 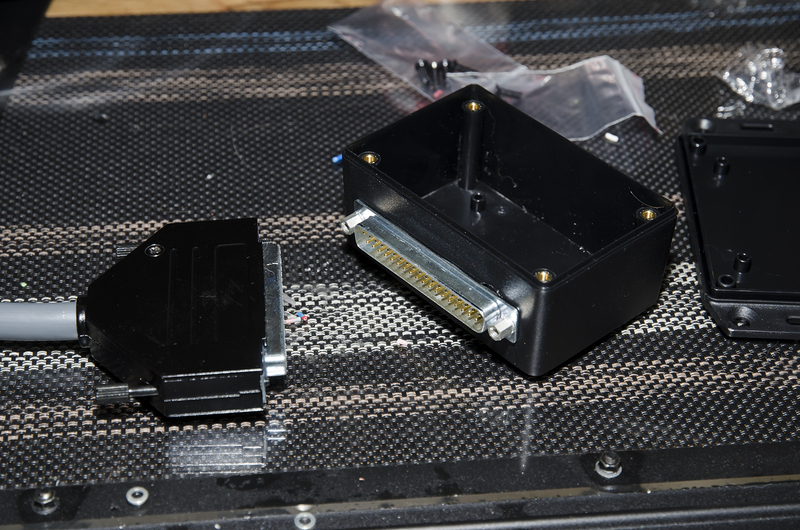 Also got a box where the male conductor will sit on the heatsink. 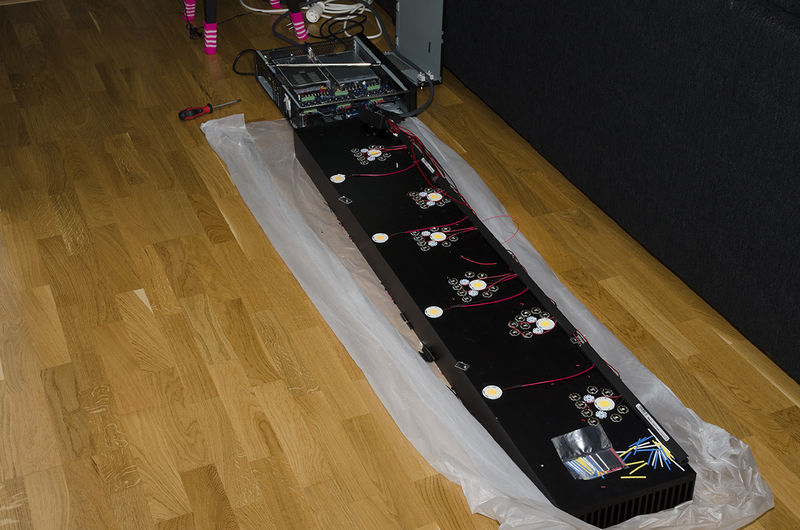 Will mount the box upside down underneath the heatsink where all the smaller cables to the leds will go out from to keep it neat and tidy. 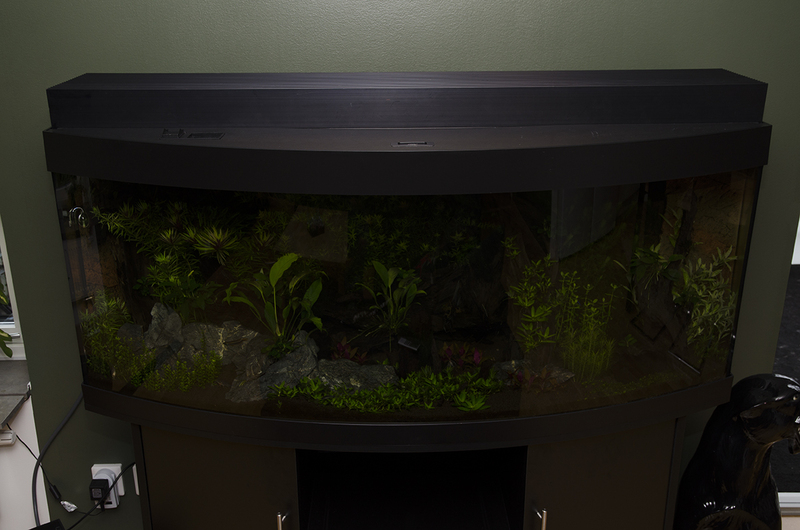 Not many pics today so will fill out with a pic of the tank as well :P Not much of carpet plants since they mostly have died of. Also cut out the Shinnersia rivularis 'Weiss-Grün' (mid-right part), to skinny for my taste, will probably try to propagate the Alternanthera reineckii 'Rosanervig' in that part instead. Hello boys and girls, Time for a little bigger update today! Have been home with a cold and a fever so have been able to dedicate some more time into the build the last 2 days. I received the Drivers from O2Surplus and the heatsink on the same day. 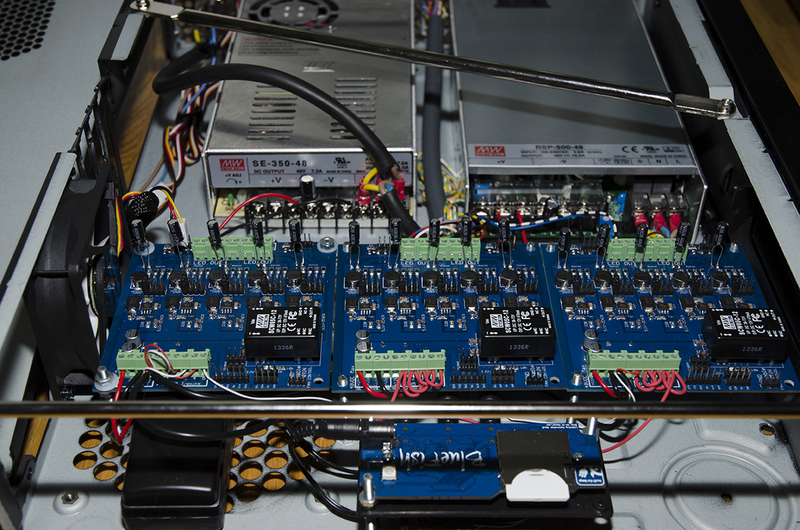 Hooked them up pretty much instantly to try them out, but had some issues getting the PWM signal to the drivers. Turns out it was the atmega chip on the board that was messing with me. After A LOT of messages back and forth with O2Surplus he suspected the above and we reprogramed the the atmega chip on each driver board. 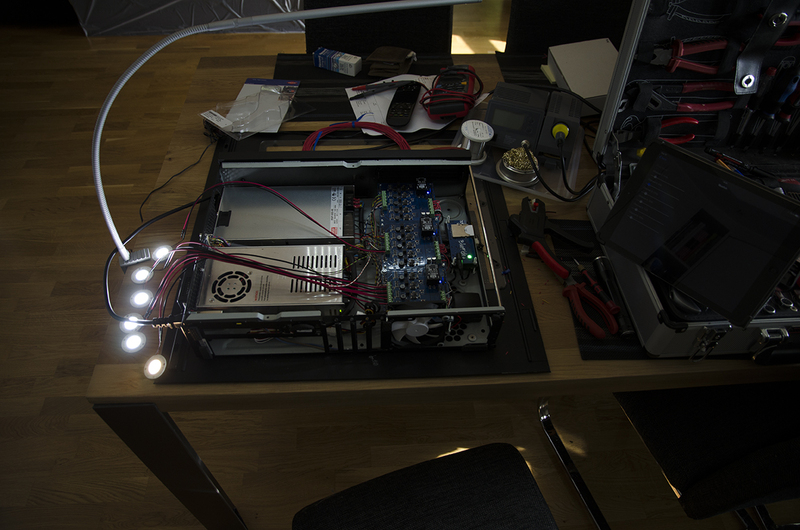 Turned out a success and the drivers and some of the leds were working. Big thanks yet again to O2Surplus, a really nice and helpful man! Picked up the build after there and here comes all the pics ! Changed the cable inside the chassis to the smaller one i bought for the connector. Mostly because I had piece over. 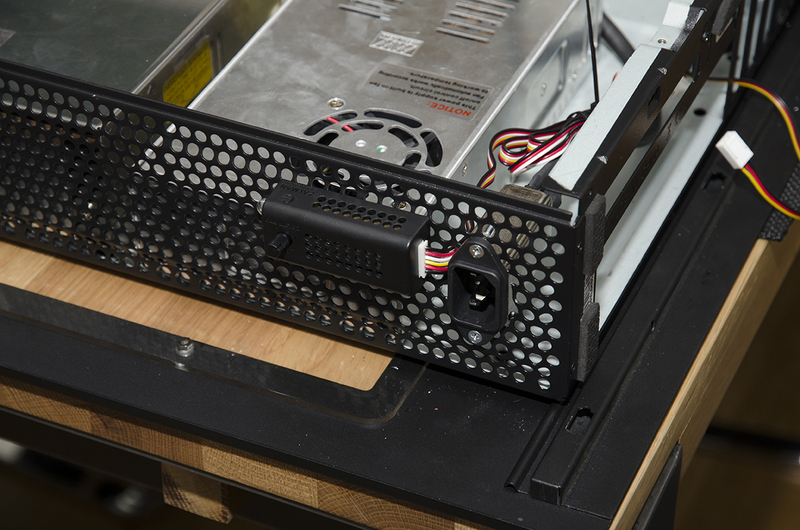 Boards mounted on some bolts to get them up a bit so the fan in the bottom can reach the heatsinks underneath the driver boards. 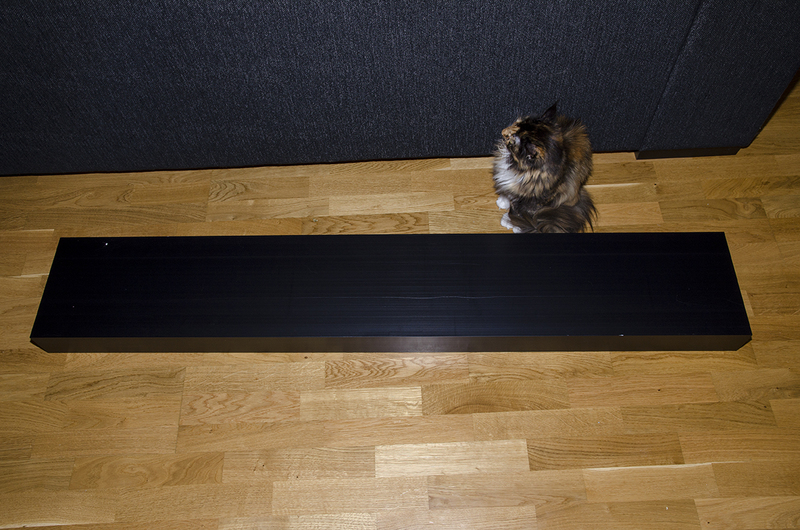 Heatsink lying on the floor. Now this piece deserves a few extra rows. Anyway it is pretty kewl! 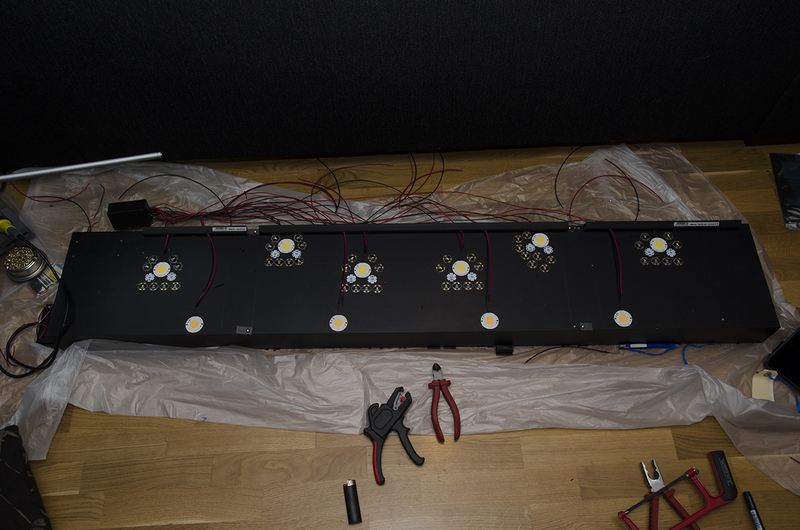 Hooking up some veros to check the Controller functions and going through all the Vero leds. Chassis for the electronics officially finished. Looking pretty tidy. Lot of gaps in the bottom though but will have to be that way, not visible anyways when it is standing. 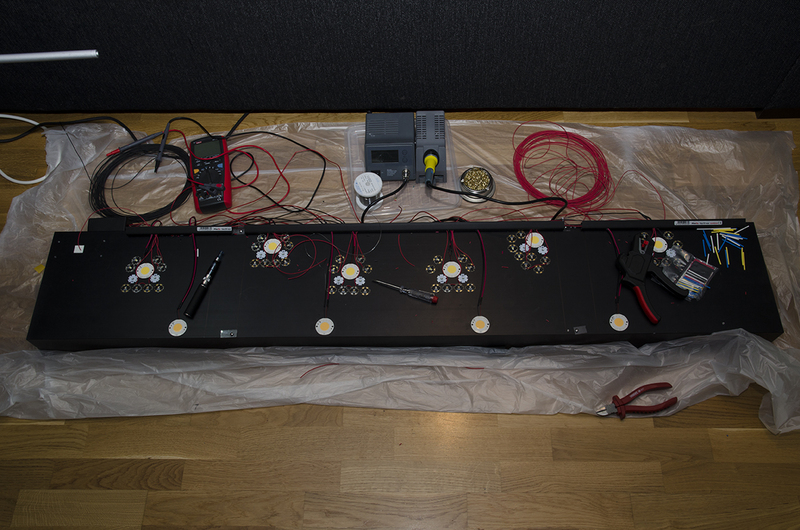 Arranging the leds on the heatsink to achieve best coverage for my tank. 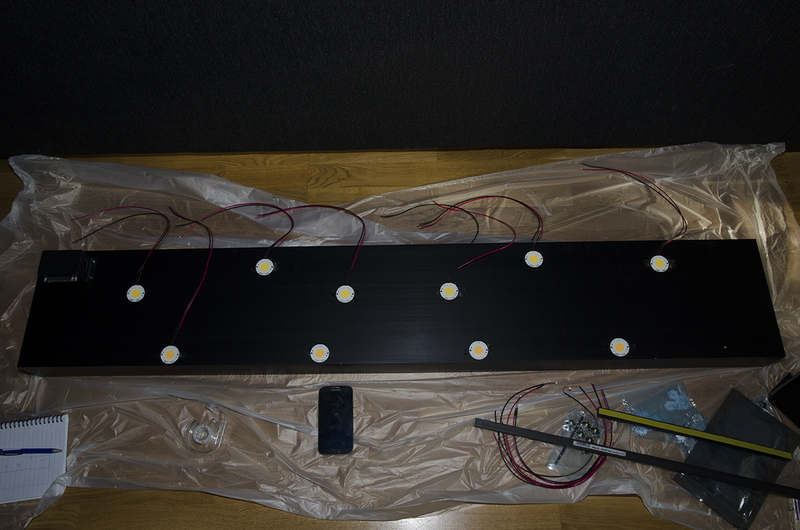 Started attaching the leds on the heatsink. Going with thermal paste and instant glue. Was planning to drill and use screws to attach. But to much of a hassle tbh. Using really small dabs of superglue on two sides. Should be able to pry them if anything brakes. Taking much more time then expected. 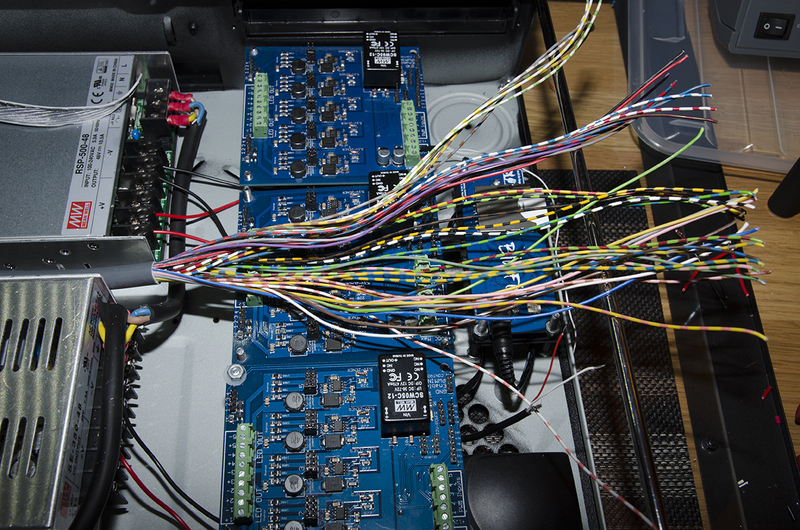 So many wires and connections to be soldered. Going crazy. The box that houses the D-SUB male for all the LED connections. 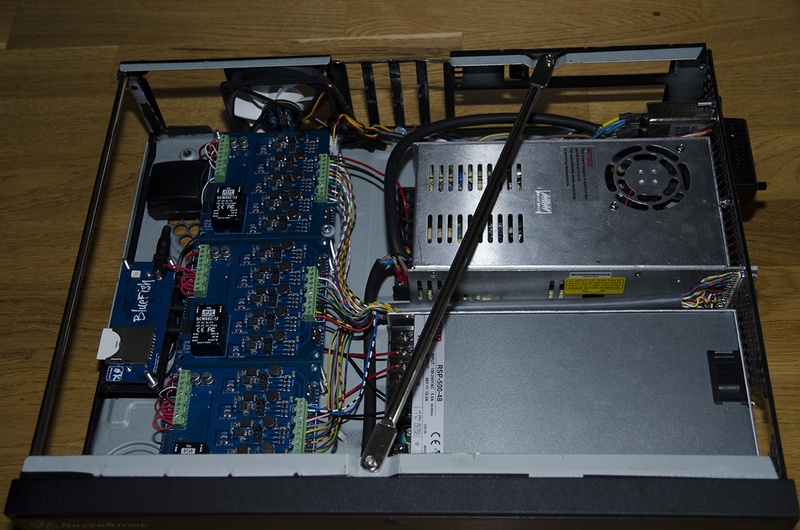 Will push in all wiring there later to tidy it up. 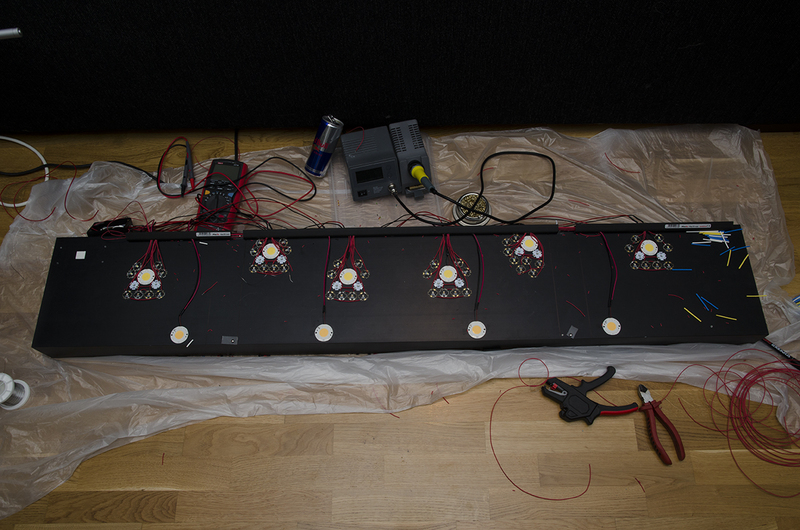 All the Vero LEDs soldered and the red LEDs as well. The rest of the colors will have to wait until tomorrow. Getting ready for a test run here. 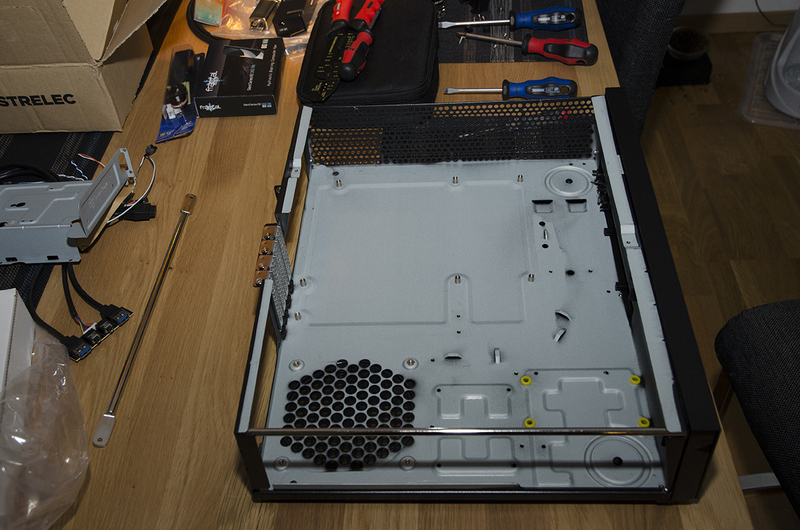 Kinda nervous tbh, checking the wiring over and over again. That's it for this time, will be updating soon with the finished build ! 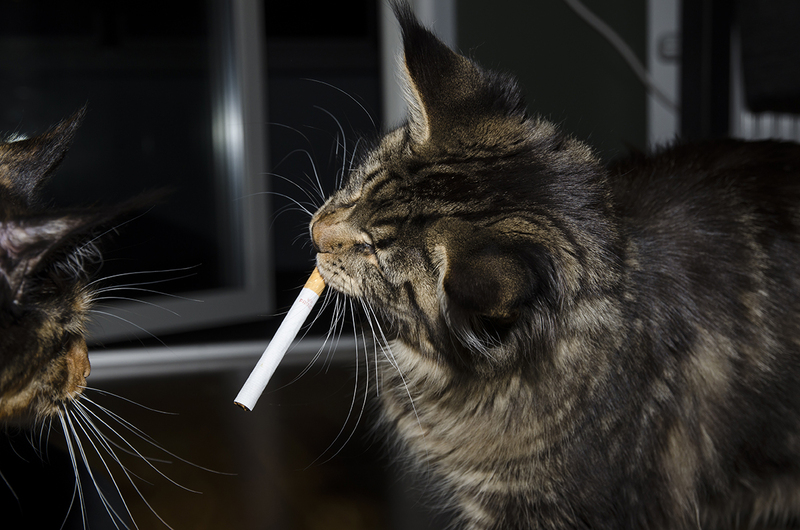 Judgement day has come. The project is close to finished except for some small details that needs tweaking. 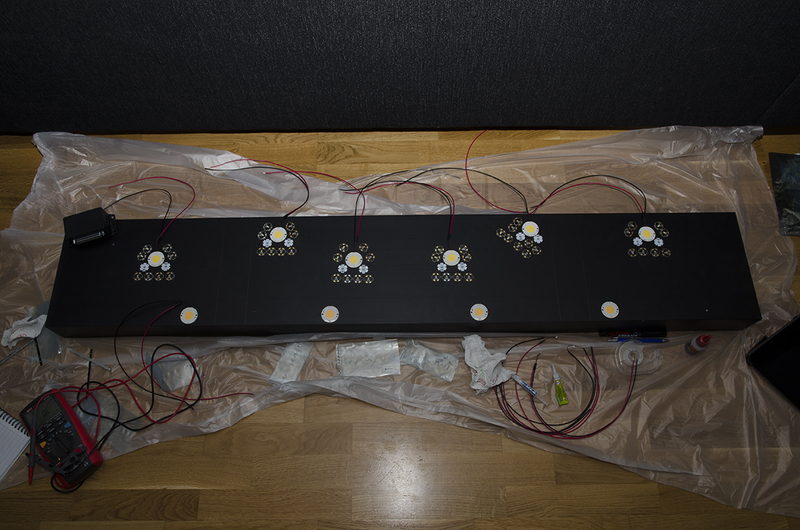 In the last update I had finished soldering the Veros and the Red leds, I will continue the walkthrough with pictures, it's more fun than reading a wall of text. 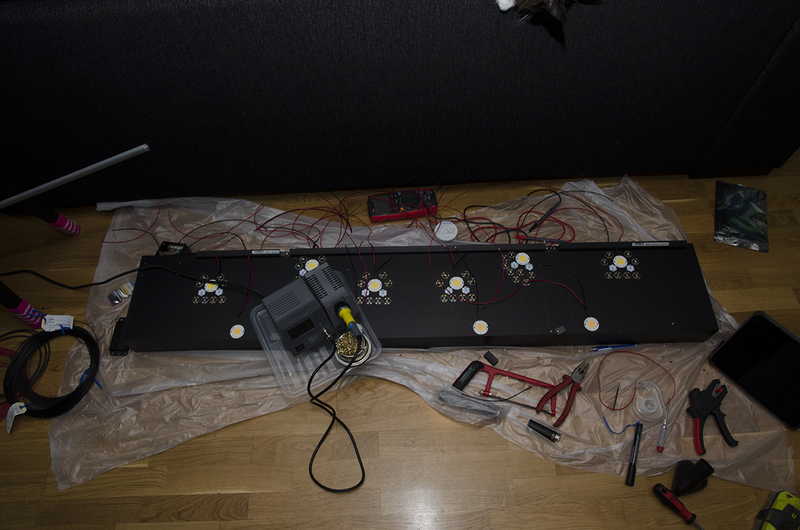 So here I continue soldering the rest of the colored LEDs, a real pain. Awkward working position and painfully many wires to strip and solder, add to that 2 cats walking on your back and head and it gets kinda frustrating. Starting to see the light in the end of the tunnel. Closeup on one of the clusters, forgot to split the stars in the top left but hey [censored][censored][censored][censored] happends! Closeup on a lit up cluster, working really well. 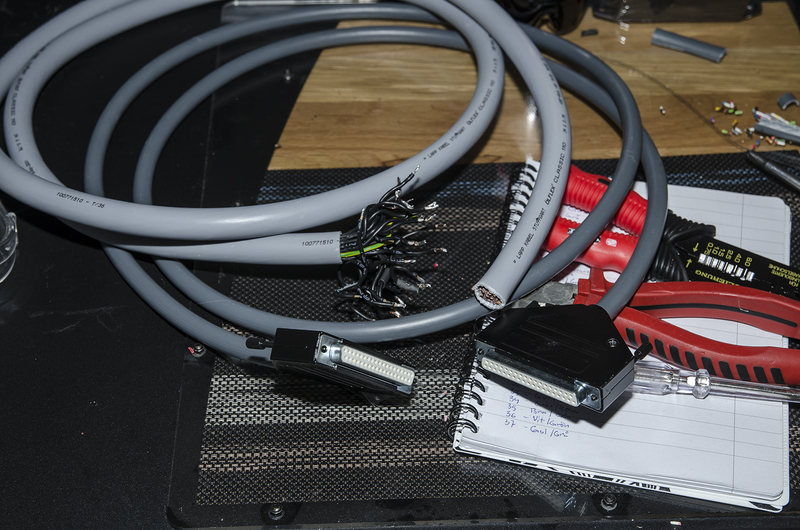 All the cables pushed into the box, was a tight fit but worked out as planned, should have put on one of those braided sleeves for a neater look but forgot. 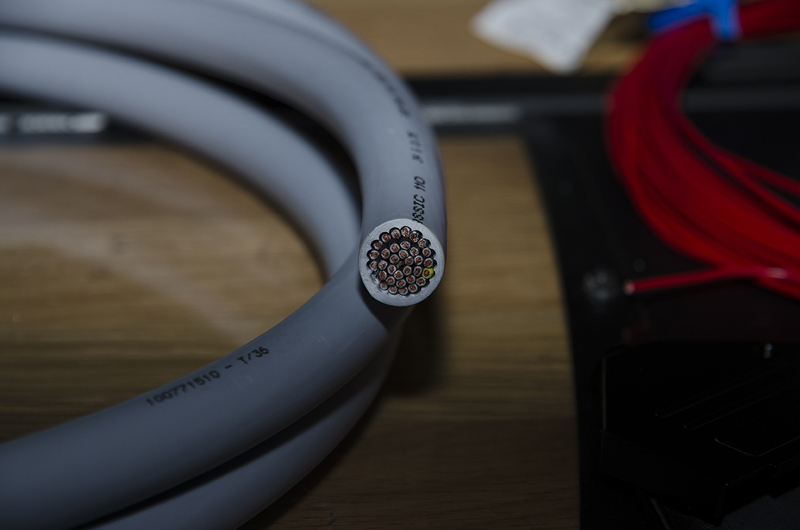 Cables clumped together with just a dab of glue to keep them from shadowing or blocking the smaller LEDs. 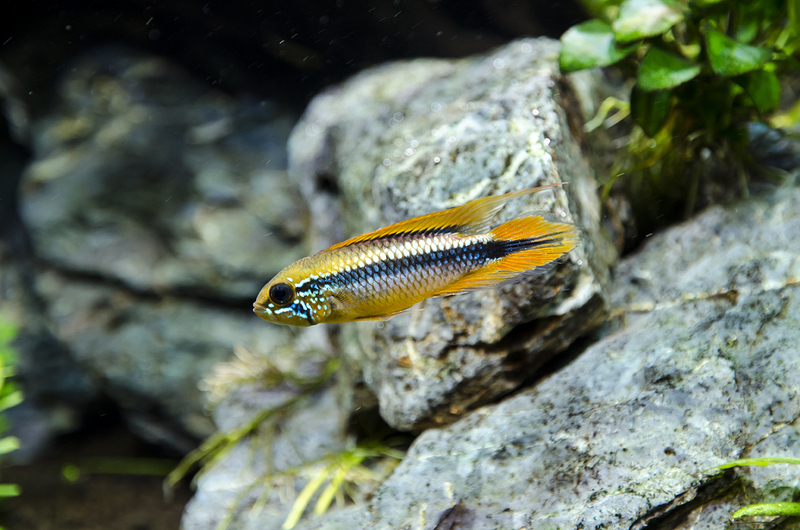 Then my girlfriend came home and helped me lift up the heatsink since it is impossible to do safely alone, which is a drawback when it comes to tank maintenance and if you for some reason become single. From the front, going really great with the tank design and does not stick out which was one of my goals for the project. Actually makes it look a bit more hightech and keeewwwl. 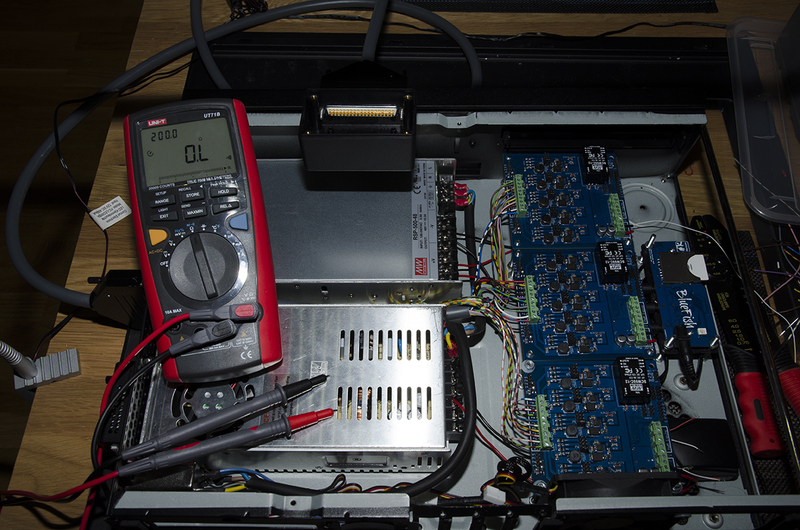 Had some issues with O2Surplus driver boards, they were making some serious noise when applying PWM dimming. 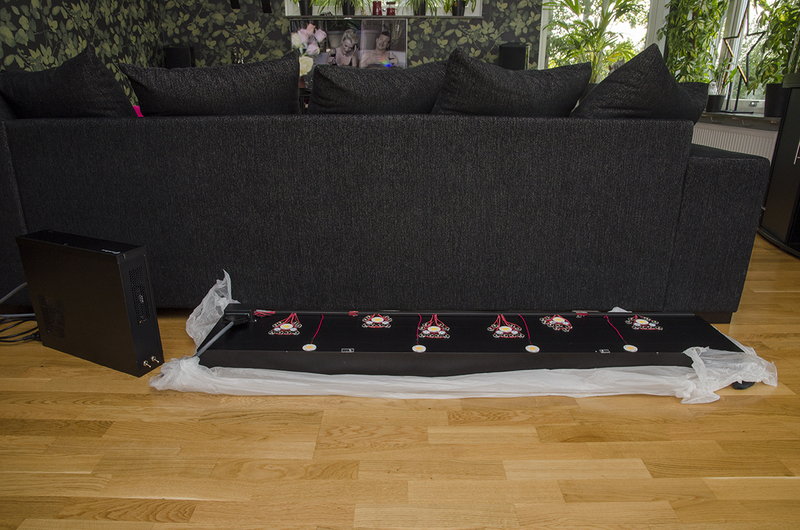 Nothing he himself had issues with but this is a different setup and they behaved a bit differently here in Sweden . 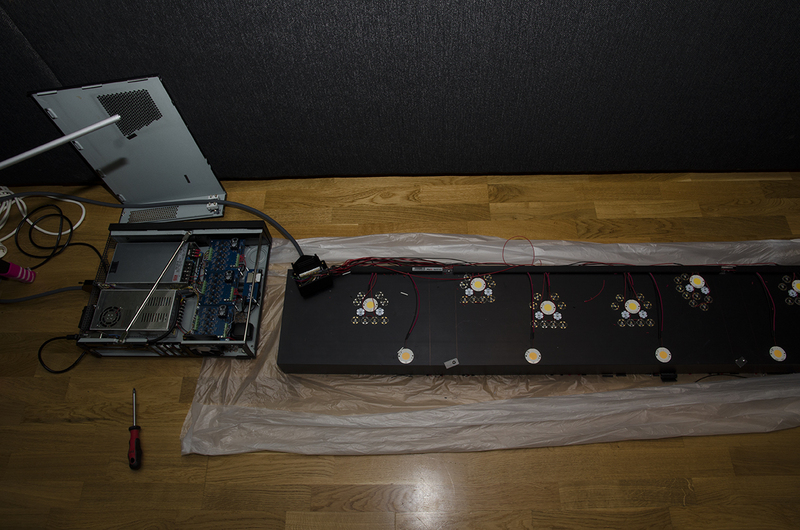 After some discussions with him we tried out a couple of different solutions, ended up with me swapping out the 15 output capacitors from ceramic ones to eloctrolytic ones and the problem was solved, no more noise from the boards when dimming! The caps that were changed are the standing ones. So that was pretty much it, gonna post some shots of the tank here. This is with all the colors at 100% which actually gives a really nice color temp. The reds compared to the tubes I had been using are really amazing. They really stand out with this light. Can be tweaked even more to make them pop. Actually tried with only the reds and blues at max and the reds on the fish looked totally crazy glowing red. Not on this pic though. He looked kinda dull before, not anymore ! Colorsssssss, no -post-editing done in photoshop, totally amazing me thinks. So not much to do now really. Getting the controller to work as I want it, just have to learn how it behaves and it's functions. Got it simulating the weather from Manaus right next to the Amazonas. Pretty nice with the simulation of clouds etc. Right now the drivers are running at the minimum current, around 300-400 mA wich gives much more light than my 4 x T5HO 54 watt tubes did and the coverage is now much better with very few dead spots. And the shadows the LEDs cast really makes a world of difference, and then we have the shimmering. All in all it really lifts the atmosphere in the tank. One problem that I have to fix is the fans in the power supplies, the fans are redonkulous loud when they start and they do every 3-4 minutes when the light is at 100% and they go for 1-2 minutes. 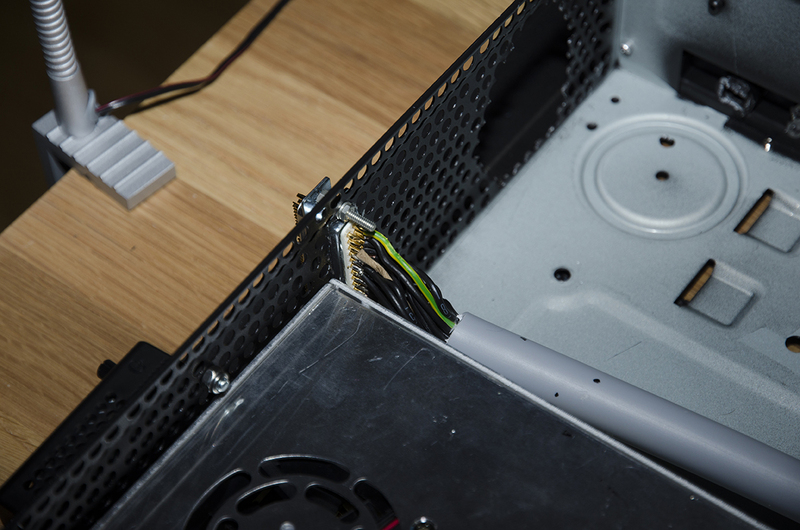 I have already cut the fan cable connected to one of the power supplies board and fitted a fan shoe for 3-4 pin fan connectors. Tried out a 120mm noctua fan and it worked as intended, no sound and the fan was just active for 20 seconds. So will get them installed tomorrow properly. All in all I am really happy with the result, it has been time consuming and kinda pricey but worth it now in the end. BIG BIG thanks to O2Surplus for all the help he has given me under the project! 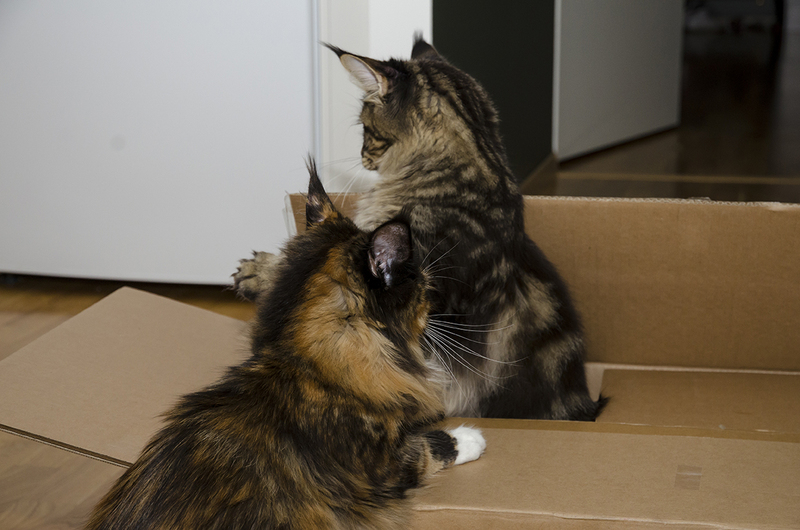 Luna and Juno says peace out! MCSLABS, MCSLABS, Gadgetboy and 2 others like this. wow will that thing be amazingly bright. 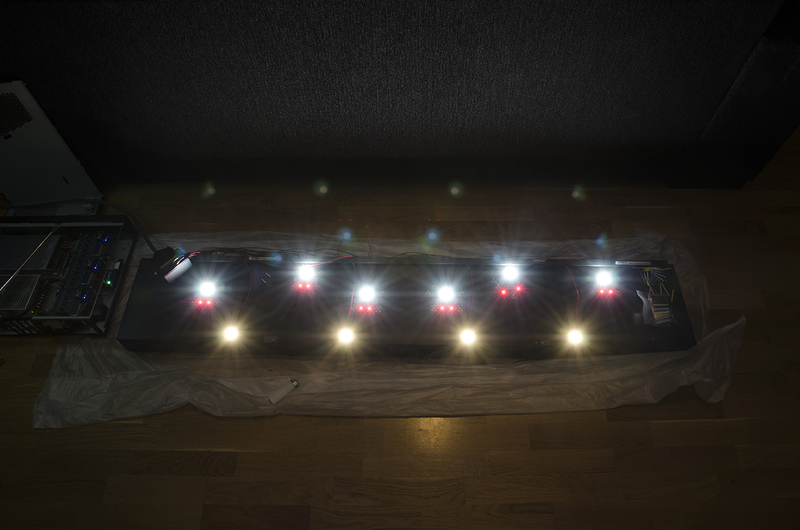 using just 5 of the 30 watt bxras, which are the precursors to the verso my 300 run at around 100 par 36 inches below the leds. 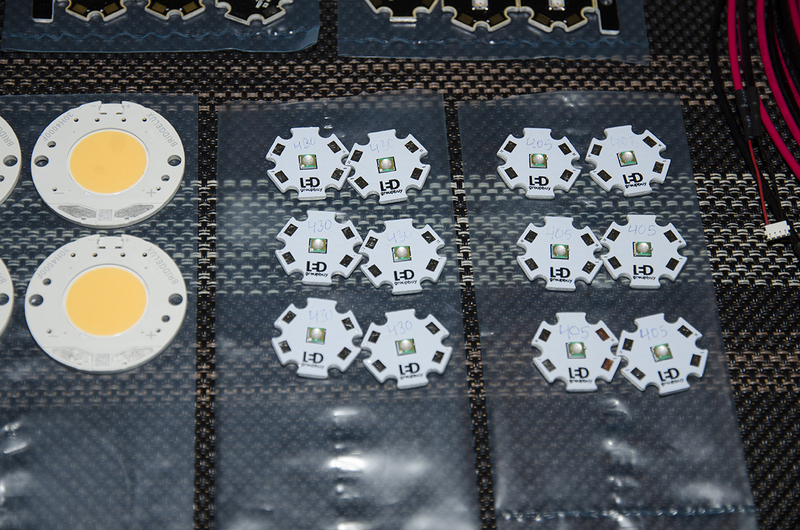 looking forward to seeing how good those really high cri lights look with and without the added colors. 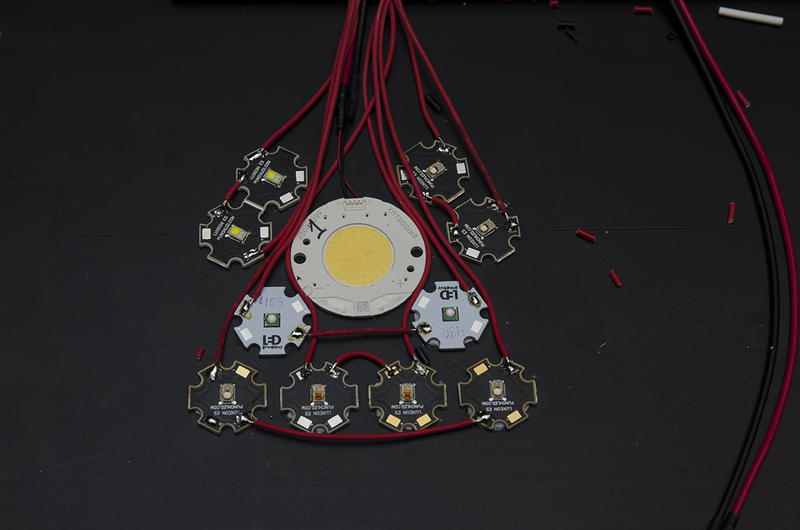 going to be debugging my lights now. Can't wait to see this thing grow algae in action! 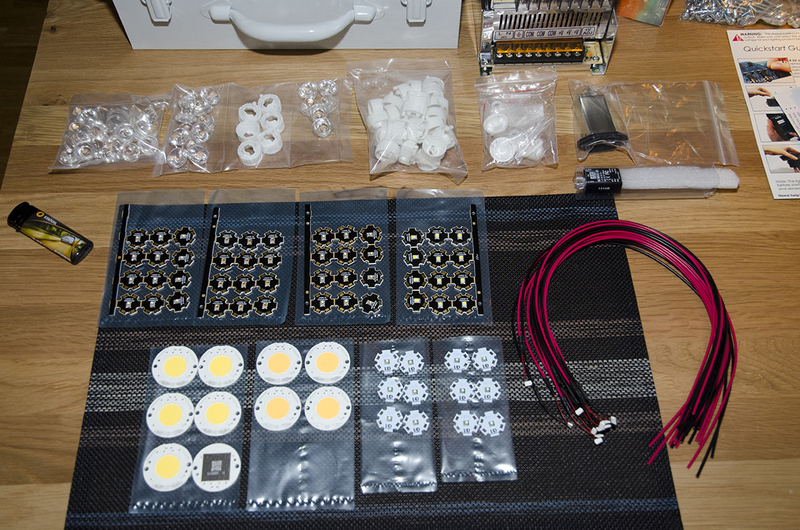 Holy crap that's a lot of LEDs. Those Vero LEDs are no joke! I almost used something similar, but was concerned about the heat from them, and went another route for various reasons. Looks very clean and professional so far, can't wait to see how rediculous those are once they're in action. Cant wait to see them up and running. Nice post! 526 Watts of LED light lol what you trying to grow ? btw you got par reading on how deep veros led goes ? For science! please run this on full power for sometime. Everything that is worth doing is worth over-doing-moderation is for the weak ! No I do not, really wish I had a par meter available to test it when finished. Got a LUX meter at work but that won't help much for reading PAR. Thanks for the link, will check that out!